If you pair a Bluetooth device to your Phoenix Android Radio, you may not hear audio playing when you select BT Music. However, you see your device connected and playing audio on-screen. 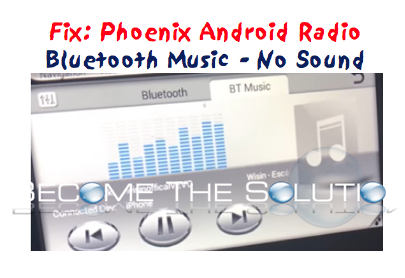 There is a bug in versions of the Phoenix Android Radio Operating System if you received or placed a Bluetooth phone call earlier, the Bluetooth call is overriding the BT Music and forcing the BT audio to be muted. Connect a device to the Phoenix Android Radio phone Bluetooth and place or receive a phone call. You can immediately hang up afterword’s. Switch back to BT Music and play audio. You should hear audio and music again.